Lenovo is back in the Android tablet market with two new slates: the Lenovo Yoga Tablet 10 and the Yoga Tablet 8. In this review, we're going to take a look at the 10-inch version and see how it stacks up to the competition, like the iPad Air. The first thing you'll notice about the Yoga Tablet 10 is that it's a 16:10 ratio display tablet, and that it's not completely flat, either. The round, bulky edge gives the tablet a stand to prop itself up, which is nice to have if you're watching videos or reading content while at a desk or table. While it's a beautiful tablet, we're going to cut right to the chase with what we don't like here: the user interface and the display. If you didn't work out the math, a 1280 x 800 display across 10 inches gives you density of roughly 151 PPI. That's 151 pixels per inch. By comparison, the iPad Air has 264 PPI and the LG G Pad 8 has 278 PPI. In other words, if you're used to HD displays on your smartphones and other tablets you might have owned or currently owned, the Lenovo Yoga Tablet 10 is going to look shockingly bad. However, if you're viewing it from a distance far enough, it's not terrible, but we still noticed that it wasn't nearly as sharp as its competition. The Lenovo Yoga Tablet 10 hardware is actually not bad for its price, and the faux-metal finish makes it feel even nicer. The glass display and body give it a halfway decent feel. At the bottom end, where the tablet is curved for the kickstand, there is the power button and headset jack opposite each other. The power button is actually really nice, and has a good feel to it when pressed. It may be odd to mention this, but when compared to other tablets, it seems really cushy. The opposite side of the power button is the 3.5mm headset jack, and above that is the volume button and a small microphone. When the device is facing you in landscape orientation, you'll also notice there are two front-facing speakers. If you purchase the tablet, you will have already noticed the Dolby logo on the box. The speakers will offer Dolby Digital Plus enhancement, which should mean that its sound would be superior to what you'd normally find on tablets. We'll get more into that later. Flip the tablet over to reveal its backside, and you'll see a nicely textured back with a smooth panel at the bottom where the kickstand flips out. Open up that kickstand and you'll reveal the microSD card slot. The Yoga Tablet 10 will support up to 64GB microSD cards, so if you have tons of media and documents you need to take around with you, we're sure you'll find plenty of storage options here. By default, you'll have either 16GB or 32GB memory options. You'll also get 1GB RAM, which doesn't sound like a lot compared to modern flagship tablets and even smartphones, but it'll be plenty for social network, watching videos and maybe a few lightweight games here and there. Like most tablets these days, the Yoga Tablet 10 also has front and rear-facing cameras. We really wish this trend would die in tablets, except the front-facing camera for video calling, but it's here. The front-facing camera is a 1.6MP HD camera, which you can use for taking selfies or making video calls. The rear camera, which should never really be used for taking stills, is a 5MP shooter. Interestingly, not long after pulling the tablet out of the box, we noticed a gash behind the flap or kickstand. We're not exactly sure what would've caused this, but it's worth noting that the metal kickstand, which is the only metallic part of this whole tablet, may be very soft, so we would be careful to take care of it. Overall, we're satisfied with the hardware and build quality of the Lenovo Yoga Tablet 10. Initially, we had mixed feelings about the design and the rounded edge, but after a while we used it more to grip and carry the device. Having the kickstand hinge is worth the unusual design choice. 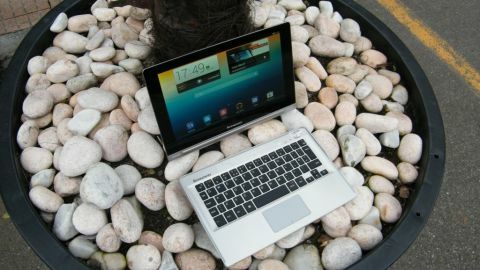 The Yoga Tablet 10 runs Android 4.2.2 Jelly Bean, so you aren't going to find the latest and greatest here. However, it will support most Android apps, and for what you might use a tablet, we don't expect any real shortcomings because of this Android version. If you're already familiar with Android, you'll feel right at home once you power on the Yoga Tablet 10. If you're new to Android, there may be a bit of a learning curve, but it shouldn't take long before you're swiping and tapping like a pro. The custom UI is hit or miss in some areas, but it's decent given the tablet's form factor and aspect ratio. By default, you get three home screens, with the main screen showing a time and weather widget, a video widget and the Google search bar. The dock below has Lenovo's browser, email client, gallery, Google Play Music, a video player and the Play Store. Swipe over to the right and you'll see a home screen loaded with apps from a power manager to the basic Google stuff, like Gmail, Hangouts and so forth. At the bottom, you'll always have the back, home and application switcher buttons, along with a menu button to the far right that allows you to add widgets, themes and access your Settings. When you hit the application switcher, you can jump from app to app like you would on any other Android Jelly Bean device. To close apps, simply swipe upward and it will disappear, although push notifications and other critical tasks will remain (e.g. push mail won't stop just because you swipe the Gmail app away). Interestingly, there isn't a button to take you to all your apps, so if you download tons of apps, it looks like you'll have to deal with having them all on your home screens. Swiping downward from the upper-left corner will bring down the notifications tray, where you can see incoming or missed notifications and messages. Swiping down from the upper-right corner will show the quick toggle options you have, like adjusting brightness, going into Settings or turning Wi-Fi on and off. If you pinch the screen, your home screen panels will appear. From here, you can add additional home screens, quickly jump to another home screen, or rearrange them as you like. If you swipe upward from here, you'll also be able to bring up the device's widgets. In order to add widgets to a home screen, first swipe the home screens until you reach the one you want to modify - its borders will turn orange and it will be centered. Then simply tap on the widget you need and it will be added to that home screen. For the most part, you just need to toy around with the UI and software to figure things out. You shouldn't worry about screwing anything up or accidentally deleting anything unless you're really pushing it. Lenovo really dumbed down the UI and software, and while it might seem like the equivalent to getting a gigantic sheet of white paper with enormous crayons, it mostly gets the job done. Considering the addition of Dolby technology to promote this tablet's sound, we weren't all that impress with what came through on the speakers. At maximum volume, music still sounded a little weak and metallic. It's almost as if the sound is being cupped, amplifying the sound of speakers that aren't of the best quality. It's a shame Dolby put its name on this thing, because its sound is truly disappointing. And we would expect high quality sound for a device meant to be propped up, a device that is ideal for consuming multimedia content. In short, we really can't recommend the Lenovo Yoga Tablet 10 to anyone. It has missed its mark, though Lenovo might be onto something with this form factor. Tragically, the display is disappointing, and the sound is weak for a tablet that boasts Dolby Digital Plus sound. On the other hand, if a sharp display and glorious sound aren't all that important to you, you could probably do worse. On second thought, you can't. For pretty much the same amount of money, you can buy a new Nexus 7, which is a superior tablet in every conceivable way. Or you can get a Kindle Fire HDX. We're hoping for big things from Lenovo in the tablet space, but unfortunately the Yoga Tablet 10 falls short in nearly every category. If you've had your eye on this tablet and were considering it, go with the aforementioned tablets instead.